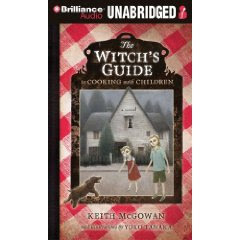 The Witch's Guide to Cooking with Children: A Novel by Keith McGowan; illustrated by Yoko Tanaka. Henry Holt Books for Young Readers. 2009. Brilliance Audio, 2009. Narrated by Laural Merlington. Review copy supplied by Brilliance Audio. The Plot: A modern retelling of Hansel and Gretel. Sol and Connie Blink's father and stepmother have decided they don't want their children around anymore; luckily, there's a witch who will take care of the children for them. The Good: "I love children. Eating them, that is." So begins the tale of Faye Holaderry, witch. Hansel and Gretel is one of the more disturbing of the Grimm's Fairy Tales. What's worse, the witch eating children or the ultimate betrayal, that it's your parents who abandon you? McGowan takes these two horrors, embraces them, and balances scary with funny. In his tale, it's not just a parent abandoning a child in a time of famine; oh no, it's much worse. It's parents who willingly turn their children over to the witch for every reason from bad grades to being kind to homeless people. Derek Wisse, turned over for disappointing his parents, doesn't disappoint Fay; not when "baked with secret ingredients and served with my very yummy homemade key lime pie." Mmmm, key lime pie. I love how the author uses humor, but also ups the horror by giving the nameless murdered children names, personalities, histories. Recipes. As in the fairy tale, Mrs. Blink is a stepmother; McGowan plays with some of the fairy tale aspects, making Mr. Blink not who he seems. Various standards from fairy tales are used, twisted, reinvented, such as riddles, helpers, hunters. Sol is 11; Connie, 8. Sol fashions himself as a scientist and inventor, like his mother, who died years before. Sol's scientific mind is a nice contrast against the magic of Holaderry. Holaderry has had to adjust to modern times (no house made out of candy or bread); but she is a witch who has lived centuries. Magic remains, even if its the magic of herbs, of hiding in plain sight. Sol and Connie find people who help them along; people who hinder; but ultimately, they need to rely on themselves and each other. I love, love, love the ending. It's delicious. Your young horror fans will be thrilled. Grownups may worry about The Witch's Guide being too scary for kids (witches eating children! bad parents!) but kids will eat it up. Professional reviews vary as to whether this is for 9, 10, or 11 and up; I say, it depends on how much the reader likes scary stories. For someone like my niece, who loves Goosebumps and scary stories and Jurassic Park? Age 9. For other kids, it will be older. There is a lot of bonus humor for the adult reader. Holaderry has a dog named J. Swift. McGowan takes a playful swing at the current "perfect helpful librarian" trope. The Witch's Guide is full of risks. It's not just the jokes for the grownups, the eating children, the satire of parenting where it's better to get rid of the child than to parent; but also in giving Sol and Connie depth of character. Sol, an inventor, wants, needs, craves respect and love and success; Connie clamors for attention, acts without thinking. McGowan's real risk is that he doesn't answer all the questions; he leaves things open; despite the humor, despite the supernatural, he makes this real because no one's life is tidily wrapped up with a bow. Questions always remain. What else? Easily a favorite book read in 2009. Thanks for this review, Liz. I was so disappointed that this book wasn't nominated for a Cybil--I loved the look of it, but wasn't able to read it in time to nominate it (or not) myself. This looks like such a fun book! Although when I first read the title, I thought that it might also be a witty title for a cookbook for parents who want to introduce their kids to cooking. Oooh... this sounds, um, delicious. Thanks for the review. We are a brand new publishing company specializing in a series of children books.If you ever have the chance please come drop by our blog and share this blog with others. Leave a comment and tell me what you think. 2009 Winter Blog Blast Tour; thanks, Colleen! JOMB; Thank You, Mark & Andrea!